Except for in rare cases (e.g. in China) Forest Tourism has not been legally accepted yet, nor in legislation nor as a term in tourist dictionary. Although many tourist activities are taking place in a forest for a long time and are included in the current law, many of them haven’t been statistically monitored because there is none legal basis for it. Non-wood forest products (NWFP) and socio-cultural values (SCV) - including income of tourism and recreational forest use as a natural source of capital - are currently not recorded in forest management plans in most countries and their national statistical databases. Despite the fact most forestry and EU development documents foster the tourist function of the forest, forestry legislation is adapting very slowly to the real needs on the demand side of the tourist sector. In existing legal acts, the admissibility of interference with the property right due to the use of forests for tourism and recreational purposes is regulated, but ineffectively. The main issue is how to coordinate free access to the forest and the implementation of tourist activities in the forest with responsible user behavior and nature protection. Free access to forests is not only an asset but also a responsibility. It is threatened by the lack of users’ responsibility and their interests which are not being coordinated with forest management and owners. 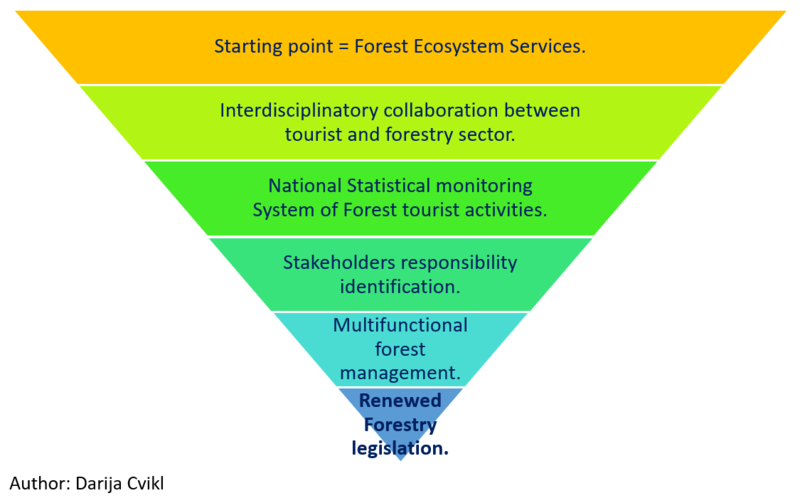 To establish forest multifunctional management and planning as well as integrate interdisciplinary decision-making between tourist and forest participators it is needed to make a different and innovative approach in understanding the legal acknowledgment of various forest services and their multilateral importance. It is not just the matter of protection of forest as a natural source due to the multifunctional exploitation of the forest, but as well as the correct approach to the definition and recognition of individual products which arise from the forest as a natural capital source. That is why tourist sector (as well as other branches besides forestry and nature preservation sector) should recognize forest ecosystem services and their applicability in various economic activities as a starting point to develop national and regional development strategies and legal basis for multifunctional forest management. The International Bank for Reconstruction and Development has defined forest as the complete ecosystem type almost 15 years ago as the only one among the existing ones (land, cities, seas, islands, mountains, polar areas, coastal areas, land waters, cultivated land) that ensures the use of all ecosystem services and represents one of the natural sources of capital in tourism and wider. Multipurpose and sustainable forest management with the exploitation of all its ecosystem services is still a hot issue today, although it appeared in WCED strategic document in the 1980s already. Awareness of the usefulness of various economic activities will enable interdisciplinary linkage between disciplines, such as tourism and forestry. Forestry profession itself is unable to cope with the tourist demand for forest tourism activities already going on. Together they can achieve positive synergy effects in transferring of knowledge and establishment of an appropriate legal basis for Forest Tourism activities. The legislation covers dealing with restrictions on property rights as well as with determining the appropriate management approach. The problem is that with the implementation of such legislation numerous dilemmas and concerns appear about restrictions of property rights and the related topics (the use and maintenance of forest roads, garbage disposal, traffic noise, emissions, equipping and arranging forests for tourism and recreational purposes). Good legislation is the one that in practice does not cause any additional tensions and conflicts, but it lowers the chances of conflicts and provides an appropriate balance between the interests of the public and individuals. In most cases, the situation is the opposite, and one of the concerns is, therefore, the efficiency of the addressed legislation - whether it hinders the possibilities and the development of tourism and recreational functions of the forest use. Sustainable use of biodiversity is the base for forest tourism, but with the limitation of negative impacts and sustainability principles, it needs to be integrated into national tourism policy. Therefore, the evaluation of all the forest tourist activities in the country is one of desired action and sub-objectives for the future as well as the implementation of national standards for responsible business practices in the tourism sector. The correct approach to establishing appropriate legal bases and maintaining the balance between public and private forest use is to understand the sustainable use of all ecosystem services of the forest primarily by the tourist profession (among others). At the same time, the forestry profession has to become aware of the need for the integration of the tourism and other professionals in the creation of legal bases for forest tourist activities. For preserving, advancing and implementing management processes of the forest ecosystem services for tourist purposes, it is necessary to provide a legal basis for establishing additional forest protected areas first. Some countries around the world have already engaged in the more or less elaborate redefinition of legal bases for the tourist use of the forest in previous years. Europe is 40% covered with forest and wooded land which provides many social benefits, including recreation and tourism. Irrespective of the recognition and the growing significance of SCV services and NWFP, which affect tourism industry, directly and indirectly, the assessment of their effects has been gradually and slowly included in sustainable forest management. However, as shown in the 2015 MCPFE report, the EU states have started to promote and plan the use of NWFP. Most initiatives and legislation changes refer to setting up conditions for improving the commercial use of ecosystems (Bulgaria, Austria, Croatia, Montenegro, the United Kingdom) and encouraging recreational use of forests (Bulgaria, the United Kingdom, Romania, Ukraine and Slovenia). The efforts, addressing the integration of sustainable management with game animals in sustainable forest management and tourist development of forest habitat is also interesting (Hungary, Croatia, Germany). However, the key implementation measures concerning the use of non-wood goods and services are currently being addressed in only a few EU states. These states have initiated action plans, development of national or regional programs (only Finland, Austria and Spain), research projects (Romania) or subsidies in the field of supporting forest tourist activities (Sweden), (MCPFE, 2015, 130). However, the awareness of local municipalities is raising in last twenty years. For example, regular surveys of the current forest situation are performed by local foresters in Celje region in Slovenia from 2013 in order to implement social functions of the forest on the legal basis and to (main reason) protect urban forest by law. The country's forest coverage also represents a tourist potential that needs to be legalized so that existing tourism activities can be properly managed and statistically monitored. The leading forest countries are presented in table 1. Some of them have had a substantial increase of forest area since 1990 till 2015 (for example Bhutan and Montenegro, Samoa), while others recorded a decline of forest area (for example Belize, Brazil). The average forest cover of 217 world countries is 33%, while the average forest cover of the 30 most forest-rich countries is 73%. 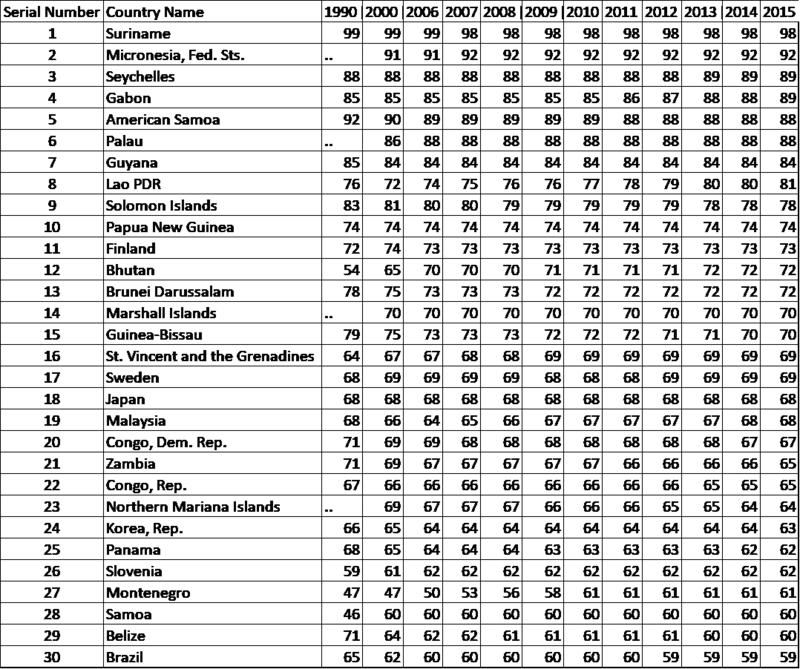 Table 1: Forest area in % of the land area from 1990 to 2015 for the 30 most forested countries in the world (source: The World Bank IBRD, IDA, 12.07.2016: http://databank.worldbank.org/data/reports.aspx?source=2&type=metadata&series=AG.LND.FRST). According to the International Bank for Reconstruction and Development (IBRD) data, in 2016 the countries with the highest forest coverage in the world are Suriname (98% forest area), Micronesia Fd. Sts (92% forest area) and Seychelles (89% forest area). According to Seychelles National Biodiversity Strategy and Action Plan 2015 — 2020, mangrove habitat management has received considerable attention over the last 20 years with the development of pilot management projects and ecotourism (boardwalks and canoeing) activities. Suriname strategic biodiversity plan 2012-2016 stated that it is the challenge to convert the concept of sustainability tourist approach into practice. However, it is not only the countries, rich in forests, that practice the most recent forest management practices directed to the investing specific efforts to change legislation in the exploitation of ecosystem forest services. In the early 1980s, Ireland started to implement the policy of increasing forest areas by 17%. In 1990 it recorded only 7-percent coverage in forests (The World Bank IBRD, IDA, 12.07.2016). Since the 1990s mainly private reforestation increased. However, an extended period of time, required for the return of the invested capital, triggered questions about other non-wood forest product – NWFP possible ways of using the forest. It showed that there is a wide range of NWFP - from leaves, essential oils, tannin, produced by trees to mushrooms, plants, bushes, as well as tourist services and recreation. The study examined a potential market for the main categories of NWFP and revealed the potential and opportunities offered by NWFP (non-wood forest products) as well as development opportunities in the tourist industry. To use a Forest Ecosystem Services paradigm as a starting point. To implement interdisciplinary collaboration between tourism and forestry sector. To establish a national statistical monitoring system for forest tourist activities. To define rights and duties of all stakeholders (owners and managers, tourist organizations, local community, tourists and other users). To introduce multifunctional forest management. To renew the forestry legislation. Implementation of the above key steps is shown in Table 2. Awareness and constant education of tourism professionals and users about the importance of ecosystem forest services are needed to avoid unnecessary legal conflicts in the further forest tourism development. Slovenia’s Smart Specialisation Strategy, Akcijski načrt za povečanje konkurenčnosti gozdno-lesne verige v Sloveniji do leta 2020 - Les je lep; EU Sustainable Development Strategy, European Commission 2009; the EU Roadmap 2050 European Commission 2011; Resource Efficient Europe, EUROPE 2020 - A European strategy for smart, sustainable and inclusive growth; The Strategic Research and Innovation Agenda for 2020 of the Forest-based Sector and the Horizons - Vision 2030 for the European Forest-based Sector. Breznikar, Andrej, Oražem, Damijan (2014). Realization of National Forest Programme in the Fields of Rural Area Development, Support to Forest Owners and Awareness-Raising of the Public (Uresničevanje Nacionalnega gozdnega programa na področju razvoja podeželja, podpore lastnikom gozdov in ozaveščanje javnosti). GozdV, vol 72 (2), 95 – 99. Cvikl, Darija. (2018). Forest innovation potential. AIRTH, ISSN 2591-2380, 2018, ilustr. http://www.airth.global/depositview.aspx?dpid=8627&lng=en. Slovenia Forest Service ... [et al.] (2013). Green Book on payments for environmental services from Mediterranean forests. ; edited by Simončič Tina, Matijašić Dragan. Ljubljana : Zavod za gozdove Slovenije, 93. GOS (2014). Seychelles Biodiversity Strategy and Action Plan 2015-2020. Republic of Suriname, Ministry of Labour, Technological Development and Environment. (2013). National Biodiversity Action Plan (NBAP) 2012-2016. Collier, Pat; Short Ian and Dorgan Jim. (2004): Markets for Non-Wood Forest Products. COFORD, National Council for Forest Research and Development, Dublin, Ireland.